Of course this happened in Russia. There&apos;s no question that driving fast is lots of fun. Most of the time, however, it&apos;s best left for the track or some other deserted road. Most drivers know this and (usually) comply. 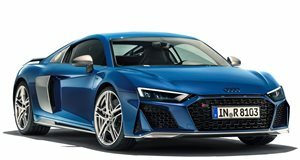 Not in this case, in which an Audi R8 driver mistakenly believes their German supercar also has the abilities of a tank. Taking place on a quiet Russian street corner, the R8 driver&apos;s decision to make a left hand turn into oncoming traffic wasn&apos;t exactly his best moment. Instead of being in front of traffic, the R8 slams directly into an unassuming driver behind the wheel of a dark green sedan. We&apos;re not entirely sure the make of that car, but after being flipped over by the R8&apos;s tank-like wrath, it&apos;s clearly totaled. Fortunately nobody was seriously injured. Just another day driving in Russia.